By LUDWIG VON KOOPA - Splatoon 2 just wants to know your favourite sport, but I turn it into philosophy. Like WSB Radio, people don't tune into KoopaTV to hear sports talk. No one reading this knows that reference, do you? Similarly, I don't think anyone reading this has a real personal stake in the differences between baseball and soccer. I've made up my mind on the question a long time ago — baseball, by far. 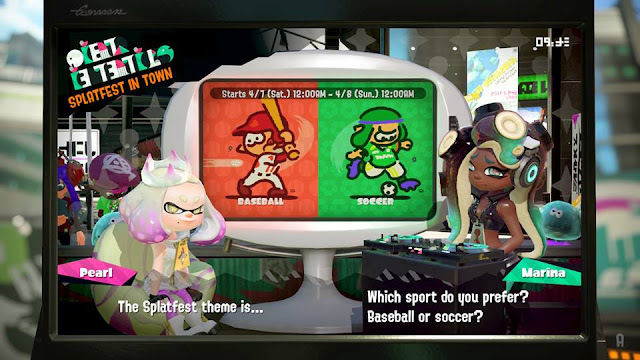 So when Splatoon 2 (in North America only — if this question was in Europe, people would respond very differently) is asking which sport you like more, baseball or soccer, for the Splatfest happening this Saturday (April 7, 2018), I sided with Team Baseball without hesitation. Why am I so strongly on Team Baseball, and similarly so against Team Soccer? It comes down to how each game is constructed, along with personal experiences with the sports — both in gaming and in real life. Allow me to explain some of that. Besides the real life part (which I'm NOT going to write about in public, sorry), I have a lot of experience with baseball videogames, and some bleh to bad experiences with soccer. I've declared Backyard Baseball to be a source of nostalgia, but Backyard Soccer was kind of rubbish. Mario Superstar Baseball is one of my favourite games ever, but I have nothing good to say about Super Mario Strikers. Just a reminder that all of the attention we gave to FIFA 18 was because of Alex Hunter and his story mode, and when it was revealed the Switch version wouldn't have that story mode, my interest went to zero. Again, because soccer is a lame sport. Let's put it this way: Baseball is a 9 vs. 9 sport, and each of those 9 players has a specific role they must fulfill. Soccer is an 11 vs. 11 sport, and besides the goalkeeper, they all technically have the same role. Everyone is on the field at once, doing whatever. You can go ahead and kind of free-ride in soccer off the work of others. People deride baseball as slow and boring, but I see it as a tribute to individuals. You get a whole three strikes and four balls worth of opportunity in the sacred batter vs. pitcher rivalry, and each of the nine batters on a team gets to have their individual time to make an impact. There is nothing like that in soccer besides a rare penalty kick. Between Mario (batter) and King Bowser (pitcher). That kind of individualistic action strongly appeals to me. Meanwhile, I could see how the amorphous blob known as a soccer team could appeal to those collectivists over in socialist Europe. Also, if you're playing baseball through a videogame, the problem of waiting on the bench waiting for every individual to have their limelight isn't as much of a problem because you'll get to control every character on your own team anyway. But they all still feel like their own person, especially with characters with such different stats in games like Backyard Baseball and Mario Superstar Baseball. Meanwhile, in Super Mario Strikers, your team members, besides the goalie (Kremling) and your captain, are all just the same drone such as Shy Guy or Toad. Your drone teammates don't get the SUPERSTAR MATCHUP! This time, between Mario (pitcher) and King Bowser (batter). You have a much higher chance of everyone feeling interchangeable and unsatisfying in a soccer game than a baseball game. Therefore, I vastly prefer baseball. One other thing: About a day or two prior to the Splatfest being announced, Kamek was asking me in our KoopaTV Discord server about what an RBI (run batted in) was. There wasn't any context to the question — we weren't discussing baseball or sports. He just somehow knew that I was the staff's baseball guy. To this day, I don't know why he was curious about that. Still, that makes it destiny that I would join Team Baseball. Plus, the fact that people can't decide what soccer's name even is (“association football”) doesn't bode well for that sport. Ludwig has admitted to liking baseball in general, and he is on record about saying that soccer is a lame sport. Is the decision easy for you to make? Do you just not care about sports? ...Are you some kind of soccer-loving socialist? Let KoopaTV know in the comments section! The Splatfest before this was chicken vs. egg. Ludwig sided with chicken. Ludwig previously claimed in the first Splatoon that he supported Team Naughty over Team Nice because of the individualism/collectivism split. Despite Japan being a collectivist culture, which affects their Splatfest decisions, they love baseball a lot more than soccer. What's the next Splatfest? No, it's not sports, but... a Teenage Mutant Ninja Turtles tournament?! But I'm going team soccer. No real reason, as I'm unfamiliar with Splatoon, but it looks cooler. Orange/red ink is cooler than green ink. ...Yeah, sounnnds like you'd be on Team Baseball. Personally, I prefer calling the second sport, "football," and America's favorite February pasttime, "American football." As we're on the subject, what are your thoughts on Rusty's Real Deal Baseball? Also, I'm not fond of football myself. When I was in the team, every game we played we lost. Not only that, we weren't able to score a single goal. Even worse, there was only one game where we lost by six goals, and every other game we got knocked out through ten goals. Basically, either every team was Germany, or we were the equivalent of three-year-olds playing a sport. So you can proceed with mere cents to get an additional game. But I refuse to because I have no interest. My next idea for a Splatoon 2 post is to draw Strike Man, a robot master who is a baseball and is the major boss of his stage unlike his goalkeeper subordinates who are only midlevel bosses. You should've gotten more upvotes on Reddit for your comment...! That is just the way it is with the Splatoon 2 plaza set up. A popular person can find someone in the square and take a screenshot and get more likes, retweets, karma etc. while the original poster might barely gets anything. Someone had to point out to me that someone screenshotted me on Twitter because for some reason he marked it as sensitive material. 2. They are already popular on social media with likes/retweets? ...Or 3, you've played with them and they stick around. Too many bad posts get in the square anyway and I doubt they get many likes or retweets. Maybe they get enough freshes by other people. There was a Splatoon interview though I forgot which one which said for a post to appear in other Squares it needs to get either many likes and probably retweets or both and many Freshes. Maybe they have a network of Russian bots! I have never cared a lot about sports. The last game that I went to was around 3 years ago when I was a cameraman for my high school football team. Since football is not an option, I am going with Team Baseball since I did play for a few years in elementary school. Although I was never that great, I can still recall the instance that I hit a grand-slam. Besides being a former player, the only professional games that I have ever attended have been two Houston Astros games. If it was American football vs. soccer, then this wouldn't be an easy decision since both of those sports are lame.